Well, it’s gratifying to see most of you voted like you were told. Paizo is liveblogging the awards and they are winning and winning and winning. d20pfsrd – silver for Best Website. Pathfinder Bestiary – gold for Best Cover Art. Pathfinder Core Rulebook – gold for Best Interior Art. Pathfinder Chronicles City Map Folio – gold for Best Cartography. Pathfinder Core Rulebook – gold for Best Production Values. Pathfinder APG Playtest – gold for Best Free Product. Great City Players Guide – gold for Best Electronic Book, it’s for Pathfinder by 0one Games. PFS #29, The Devil We Know – silver for Best Electronic Book. Pathfinder GM Screen – gold for Best Aid or Accessory. Pathfinder 31 – gold for Best Adventure. Pathfinder Bestiary – gold for Best Monster/Adversary. Classic Monsters Revisited – silver for Best Monster/Adversary! Pathfinder RPG – gold for Best Game! Pathfinder RPG – gold for Product of the Year! 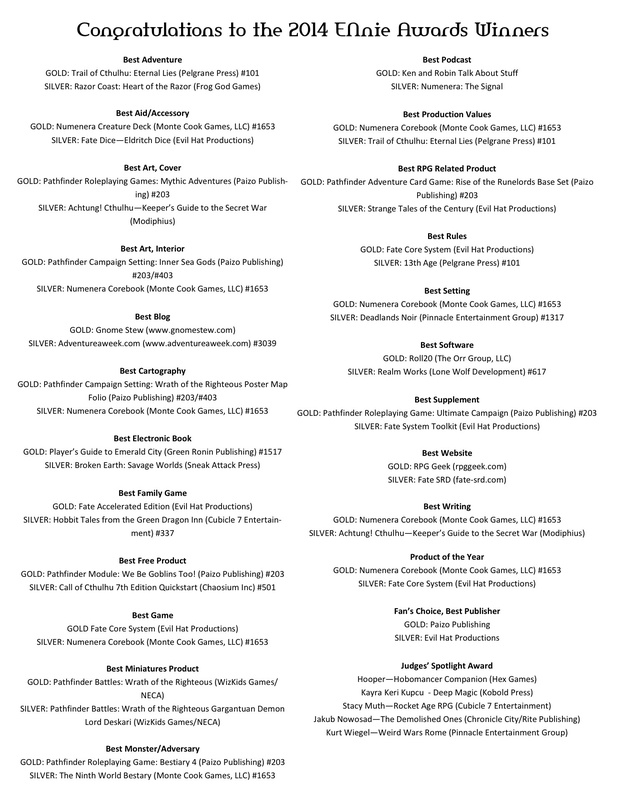 Paizo – gold for Best Publisher! For those keeping track, they won gold or silver (or both) every category they were nominated in. And it’s well deserved. I do kinda hate to see anyone win it all, but if there’s a single game company that deserves it, both in a cosmic sense and because of the unflagging high quality and volume of product, and customer support – it’s Paizo and Pathfinder. It really is great, among the very top handful of RPGs ever. D&D 3.0 itself was the only previous game that hit my gaming groups with anything near this amount of excitement. It’s a game meant to be played, supported by the best adventures since 1e AD&D. And it’s great that other companies publishing for Pathfinder won too; yay third party ecosystem! If you haven’t tried Pathfinder yet, you owe it to yourself to give it a try. It really is great. Here’s the full list of winners, now that it’s available! Congrats to all of them.